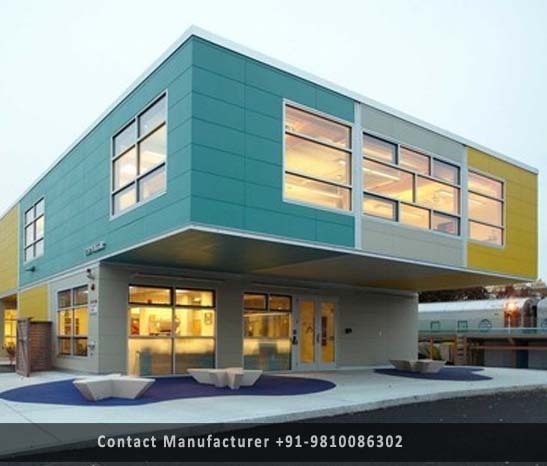 Prefab Modular Buildings Manufacturer in Delhi, Prefab Modular Buildings Supplier in Delhi, Prefab Modular Buildings in Delhi. We are the national leader in modular buildings and office trailers, workforce housing, camp & lodging services and worksite services. We take full advantage of a controlled production environment, the latest manufacturing technologies, and the design flexibility of modular construction to produce high-quality permanent or temporary prefabricated buildings for any demand. Modular shapes are the major benefit in manufacturing prefabricated buildings or prefab buildings as they allow for consistent production. This helps factory engineers and technicians to continually monitor the process and make improvements where required which guarantees the best quality and continuous improvement. We house modular buildings provide a superb range of standard and custom-made accommodation systems for a variety of market sectors & can offer you wide range of choices to choose the best which meets your expectations, our modular accommodation systems are constructed to give you unrivalled quality assurance and tailored and flexible pricing options.